Nothing can quite prepare you for the joyfulness of A Town Called Panic (Panique au Village). From the minds of its creators, Stéphane Aubier and Vincent Patar, it’s a French TV show that originally aired in Belgium in 2002 and consists of 4-5 minute segments in which stop-motion animated characters, including Cowboy, Indian, and Horse, do mundane things but in extraordinarily silly ways, finding themselves going on unintentional adventures, or simply getting themselves into trouble. Over time, the show’s popularity was such that it was eventually made into a film in 2009, and later into two additional half hour specials in 2013 and 2016. Never before released in the U.S., A Town Called Panic: The Collection is a long, overdue release of all of the original episodes of the show, as well as the two half hour specials, in their entirety. More than a handful of adjectives could be used to describe the perfect insanity of A Town Called Panic: childlike, enchanting, nonsensical, creative, adorable, whimsical... the list goes on and on. It’s greatest asset is that it never sets foot outside the realm of playfulness. It’s as if we’re watching a child play with his much-beloved set of toys, and the simple nature and randomness of the events as they occur are a major component of the show’s charm. For instance, in The Christmas Log, Indian and Cowboy haven’t been good all year, so Horse calls up Santa Claus and asks him not to deliver their presents. Santa then goes upstairs with his reindeer friend and plays cards in the kitchen. Cowboy and Indian then go to great lengths in order to get those presents, by hook or by crook. The simple-minded story mechanics is what makes the show so enjoyable. Cowboy and Indian are often selfish characters and the comedy comes from them butting heads with Horse, who acts not just as their better, but their parental figure as well. Much of the show’s appeal, at least to me, also comes from its original language track, which is in French. In the U.K., the show was re-recorded for English-speaking audiences by Aardman Studios, and for the two specials found in this new Blu-ray release, they’ve been re-recorded yet again with American voices. I personally feel that there’s something akin to being lost in translation when the show isn’t presented with its original language. First of all, the performances from the voice actors are funnier, and second, it’s one of those shows that doesn’t thoroughly require its audience to speak its native language in the first place. Because the show is so straightforward, you get the gist of what’s going on without the dialogue just as much as you would with it. The British-sourced performances are better, at least compared to the American ones, but the original French audio is the best option by far. Regardless, GKIDS and Shout! 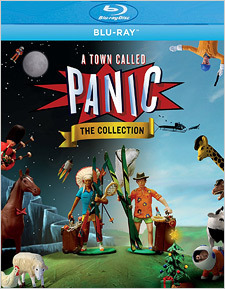 Factory’s Blu-ray release of A Town Called Panic: The Collection gathers together all 20 episodes of the original show, including Cake (Le gâteau), Cow-Hulk (Cob’Hulk), Easy Chair (Le Relax), Still Life (Un séance de pose), Lisa & Jan (Lise et Jan), Robin (Robin), Fox Hunt (La chasse au renard), The Grand Day Out (La belle excursion), Indian Treasure (Le trésor d’Indien), The Cycle Race (La course cycliste), Constable’s Fantastic Voyage (Le voyage de Gendarme), Donkey Gets Kidnapped (On a kidnappé Âne), The Big Sleep (Le grand sommeil), Cowboy & Indian Go Camping (Coboy et Indien au camping), The Picnic (Déjeuner sur l’herbe), The Card Thieves (Les voleurs de cartes), Cowboy Goes Hunting (Coboy chasseur), Horse’s Nephew (Laurent le neveu de Cheval), Jeanine & Steven’s Vacation (Janine et Steven en vacances), and The Play (La pièce de théâtre). Also included is a new short The Noise of the Grey, as well as the aforementioned half hour specials The Christmas Log (AKA Christmas Panic!) and Back to School (AKA Back to School Panic!). Sadly, the film of A Town Called Panic isn’t included and, as of yet, hasn’t had a U.S. Blu-ray release. Perhaps one day. When you watch either the half hour specials or the original episodes, you’re given various audio and subtitle options, and depending on what you choose, English or French title cards will open the show. As far as the A/V quality is concerned, it’s a slightly mixed bag as the original show is presented in standard definition and is slightly pillarboxed. Whether the show was even produced in high definition or not, I’m not entirely certain. However, the quality really isn’t that bad, and is a definite step up from anything seen online. The two specials, on the other hand, have been included in high definition and look excellent with strong colors and high levels of fine detail. The textures on the clay sculptures are a definite standout. For the shorts, the audio is presented in either English (British) or French 2.0 Dolby Digital with English subtitles. For the specials, the audio is presented in English and French 5.1 DTS-HD with subtitles in English SDH, English, and French. Whether it’s in stereo or in surround, the audio for the show and subsequent specials is quite active with high levels of fidelity. The sounds of the characters as they move, particularly anybody with hooves or with spurs on their boots, comes through beautifully. For whatever reason, the British audio tracks for the two specials haven’t been included, and that the newly-included short The Noise of the Grey is presented with French audio only (with English subtitles, of course). No extras have been included with this collection other than the new short and the episodes themselves, but I’m just happy to finally have a proper stateside release of A Town Called Panic. It’s a delightful show that more and more people need to get their eyes on, and thanks to the GKIDS label, we now have a great collection for consumption. Now if we can just get this kind of an upgrade for the 2009 film, I’ll be a happy camper. Highly recommended overall.